Focusing on "disruptive technology" -- the Honda Super Cub, Intel's 8088 processor, or the hydraulic excavator, for example -- Christensen shows why most companies miss "the next great wave." Whether in electronics or retailing, a successful company with established products will get pushed aside unless managers know when to abandon traditional business practices. Using the lessons of successes and failures from leading companies, The Innovator's Dilemma presents a set of rules for capitalizing on the phenomenon of disruptive innovation. When it is right not to listen to customers. When to invest in developing lower-performance products that promise lower margins. larger and more lucrative ones. 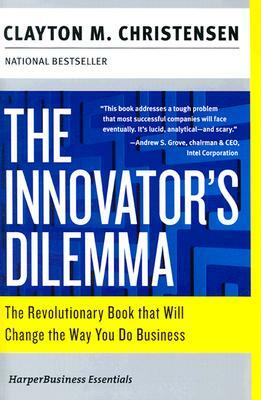 Sharp, cogent, and provocative, The Innovator's Dilemma is one of the most talked-about books of our time -- and one no savvy manager or entrepreneur should be without.